Yes, There Really Is A Town In Liberia Called 'Smell No Taste' : Goats and Soda It's the place where a teenager died of Ebola this week. And, like all unusual geographic names, there's a story behind it. 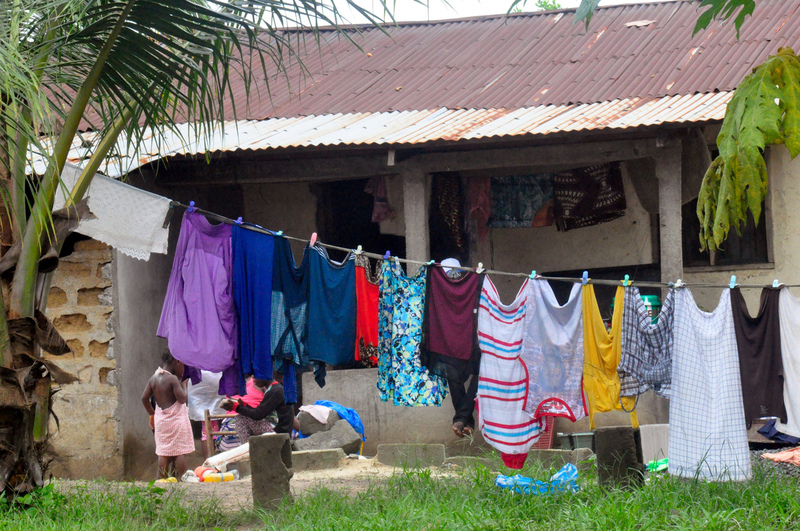 This is a photo taken in the town of Smell No Taste, where a teenager died of Ebola this past week. The home where he passed away is now under quarantine. A curious detail appeared in stories about the death this week of a 17-year-old boy from Ebola. As The New York Times reported: "Abraham died Sunday in his father's home in a community known as Smell No Taste, a few miles from his mother's home and a short distance from Liberia's international airport and the Firestone rubber plantation." Smell No Taste? It seemed as if someone was pranking the Times. To check it out, we got in touch with James Ciment, author of Another America: The Story Of Liberia and the Former Slaves Who Ruled It. "During World War II, Liberia became an important trans-Atlantic landing site for military flights, as Liberia is the closest point between the Americas and Africa," Ciment wrote in an e-mail. "To guard the runways (as well as the country's critical rubber plantations), the United States posted several thousand black GIs there. Their base was off-limits to most of the Liberians, but the smell of all that abundant American food cooking drifted beyond the base's perimeter, hence the name." Freelance filmmaker Arwen Kidd, who has been based in Liberia since 2008, knows Smell No Taste well. She made a movie named after the town, profiling a teenager whom she describes as a "mover and a shaker." To get to Smell No Taste, she says, you drive about an hour from downtown Monrovia toward the airport. "I describe it as a large village or a small town," she says. "It's big enough to have a school." The town is also known as "Unification Town." And there's a story there, too. While looking for information about Taste No Smell on the Internet, I found a reference to another Liberian town with an unusual name: F*** No Pay. The origin story is that those same American GIs would visit local prostitutes and not pay for their services. The government supposedly renamed both of these towns "Unification Town" in advance of a visit in the 1980s by Liberia's president. Now we all know that the Internet is — how to put this charitably — not always trustworthy. So I checked with my sources. Ciment hadn't heard of the obscenely named town. Kidd said she had heard about the name from a source at the airport while she was making her movie, but she doubts that it's true. So maybe it's an apocryphal tale. Still, you have to admit, it's a great story. Meanwhile, other Liberian towns, Ciment says, take their name from the places that settlers from America left behind: Greenville, Kentucky, Virginia. Like Smell No Taste, they're a reminder of the ties that bind the U.S. and Liberia.